We went to Madrid last weekend. It was not quite as we expected, but traveling and traveling with kids and traveling to cities with kids never is. Scott and I thought our itinerary light enough; we travel with our kids enough to know to keep the days simple and the expectations low. 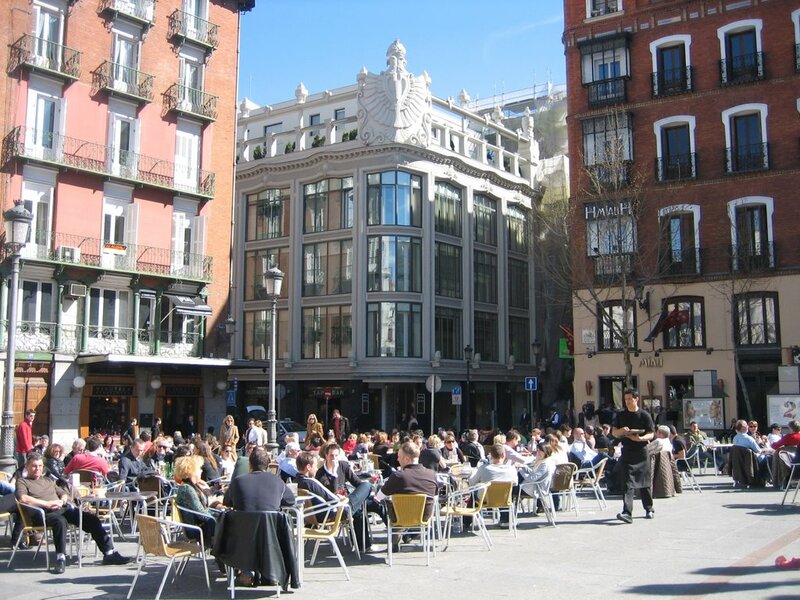 We were going to return our leased French car, visit the Prado Museum and take the train home. Everything started off as planned, and we left after school on Friday for the some three hour drive. We found our hotel easily enough, checked in, had dinner and off to bed. Scott returned the car the next morning, and we were soon all piled in a taxi and headed to the Prado. It was a beautiful day, sunny but not too hot. I was excited to be back in a city with lots of streets to aimlessly wander, architecture to see, windows to shop, cafes to sip coffee. Oh yeah, I was here with the kids though! We had skipped visiting the Prado two years ago when we were in Spain since we thought the girls too young, and there wouldn’t be enough to interest them. But we thought since it was one of the main attractions we missed then, we should try it now. Emma loves art museums, and I thought there would be enough to keep Grace interested for a few hours at least. My first mistake was assuming it had something to offer us all. I should have done some prep work and re-familiarized myself with Rick Steve’s guidebook steering families away and around back to the central park instead. So the Prado was cut short due to boredom, hunger, impatience and censorship. We headed to the café to sip beer and café con leche! The next goal of the day was a leisurely lunch. Scott navigated us through not too many streets, so we thought, to Plaza Santa Ana. Off the main streets, the square was lined with restaurants all offering outdoor café tables, two small kids play structures, an accordion player and lots of people wandering about enjoying the beautiful Saturday afternoon. After a tantrum or two about whether to sit in the sun or shade, we negotiated our way to a four-top table right on the edge of the tables in the middle of the square. Perfecto. We can enjoy a bottle of wine, the kids can run in the square where we can see them, and all will be as planned. And it kind of worked that way, until I realized that my backpack had been stolen! Classic tourist error on my part. I relaxed, let my guard down and didn’t have it under the table, wrapped through my leg! Two guys apparently casually walked up behind me, picked it out from under my chair and sauntered on through the plaza. The couple at the table next to us watched it all, and mentioned none of it until I asked if they’d seen anything! Fortunately, I had all of the important things on me…money, credit cards, passport. They got my favorite pair of traveling pants and sandals, my new tube of Murad under-eye cream guaranteed to minimize dark circles, my camera and cell phone, and my hat, which Scott says he never liked anyway. If I wasn’t traveling light before, I definitely was now! That kind of killed the buzz from the nice bottle of Rioja, so we somberly walked to Madrid’s central park and enjoyed an ice cream and some aimless wandering before our train to Valencia. The girls decided to work on their navigation skills so, after much arguing about who got to go which way first and who got to hold the map, we made it to the station. We’ve had great success with train travel in Spain before and this trip too was fine, until it arrived 25 minutes late and we missed our connecting train to the station where our car was parked. And that just happened to be the last one of the night. So, it’s 11:00pm and we’re walking, again, around Valencia this time with tired kids and no where to stay. Fortunately, the train station is right near plenty of hotels, and we ended up at four stars for the night. Best sleep I’ve had in a week actually! No nightmares woke any of us up! So we slept in on a fine Sunday morning in Valencia and thought we might use the unexpected day there to wander and explore. The girls had had enough wandering and exploring though. One city in one weekend was enough for them. They were eager for another train ride; the one back to the car that would then get us home. Key learnings for our next travels to a city: less walking, more taxis, scout out museum beforehand, wrap backpack around one’s foot, and there’s always another train the next day. Sorry to hear about the theft. Still, Madrid is a great city. I’ll be back in April. Thanks for the post. I have some Spain photos and other stuff at my blog, http://www.bentpage.wordpress.com. Enjoy!